The Fortuna Family Wishes You & Your Family a Happy Easter! Click here for our monthly coupon special or show this coupon on your mobile device to receive $10 off discount! We have been featured in the Buffalo News, please check out the article by clicking HERE or the image below. Enjoy the Tastes of Southern Italy! If you’re looking for a taste that’s as unique as the Falls, Fortuna’s Restaurant & Banquets in Niagara Falls is your go-to destination. True flavors of Italy are found in every bite of our hand-made gnocchi, ravioli and lasagna, plus our fresh cuts of veal and steak, poultry and seafood. We make our meals using the best locally sourced ingredients, including our savory salad dressings and robust sauces – all of which are guarded family secrets! Offering delicious Italian cuisine and a welcoming atmosphere in beautiful Niagara Falls, we are a third- and fourth-generation family-owned and operated Italian eatery. Our traditional recipes and tastes have been passed down for more than 70 years, giving our customers today the same tastes that brought their grandparents in decades ago. Our banquet facilities are also a spacious option for weddings, showers, reunions or any other event. With room for up to 80 guests, and our full range of menu offerings, make Fortuna’s your choice for any grand occasion. 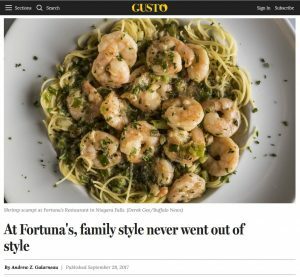 Come in today and try some our authentic southern Italian cuisine and see why everyone “Falls” in love with the great tastes at Fortuna’s!